A medical clinic for Syrian refugees in Jordan is helping a new network of families. People feel able to talk about their circumstances to the team and are willing to be prayed for. This has brought up issues of domestic violence, broken marriages, and trauma from the violence of the Syrian war. Pray for healing in these areas and discernment for the team in following up with people. May there be open hearts ready to receive from and respond to the Lord. Pray for a Christian-run clinic in Jordan. They can hear and feel the bombing from across the border in Syria. May they find Christ as their peace in the midst of this distressing sound. Pray for daily grace for the staff as they serve each person who comes to the clinic seeking healing and help. Pray for a transformation of hearts and bodily healing. Pray too, for a clinic run by workers in Jordan specifically for refugees where there has been a real sense of openness, with people eagerly receiving, and even asking for prayer. God has touched people with healing and with receiving specific words for others. As a result, fruitful relationships are being built. Syria is still facing extreme violence and unrest as families continue to be forced out of their homes to find safety. Another 100 Kurdish families have recently entered Bourj Hammoud in North Lebanon after fleeing deadly violence and persecution. These families have experienced terror, lost loved ones, and are left hopeless. The Free Evangelical Association of Lebanon is supporting refugees by providing food, clothing, blankets and other essentials as well as sharing the good news of Jesus and offering prayer support. Please pray for all the refugees who have been through such trauma, and ask that they will find peace and hope in Him. A Kurdish couple at the Arab Baptist Seminary have family trapped in Afrin as the bombing continues relentlessly, and the whole college community is concerned. A Syrian church leader commented: “Our cautious optimism of a few months ago has turned to growing pessimism. The situation has become an intractable impasse. But in the face of death and fear, Christians remain committed to peace, justice and forgiveness.” Join them in fervent prayer for this region where violence impacts so many, especially this student’s family. When it comes to the Middle East, it’s rare to hear about peace these days. But TWR’s listeners there are mentioning peace when they respond to our Arabic programmes on the radio and internet. One listener said this: “You were talking about forgiveness. In such a time as this in Syria, how can I forgive those who hurt my own people? Through your episode, something has touched my heart and soul. I have peace and trust that the Lord is capable of handling our pain. His will is above all situations. I surrender to him and trust.” Please pray for these precious listeners. The continued conflict and unrest in the Middle East and North Africa (MENA) region are directly impacting the lives of more than 50 million Arabic speakers. As a result, there is a spiritual hunger for truth, change and peace. Amidst danger and uncertainty, SAT-7 viewers are grappling to live faithfully for God. One way in which SAT-7 is seeking to teach and equip Christians is through the TEACH project (Theological Education for Arab Christians at Home). TEACH aims to provide systematic theological teaching for Arab believers who often have no other means of receiving it. Please pray for all those receiving this teaching to be built-up and equipped to share the gospel and spread the flame. The Egyptian coastal city of Alexandria has become home to thousands of Syrian refugees. These frightened, desperate people face high rents, low employment and limited access to healthcare. This makes pregnant women particularly vulnerable as they struggle to obtain medical care during their pregnancies. Embrace the Middle East’s partners at Refuge Egypt have been responding to this need by providing antenatal and maternity services at Alexandria’s Victoria Hospital, specifically for refugees arriving from Syria. As well as medical care the women receive food parcels and iron supplements and can attend classes on child development, nutrition and breastfeeding. Pray for the thousands of women across the Middle East who are pregnant or with very young babies who are cut off from their homes and families by the Syrian war. Pray for Refuge Egypt as they seek to serve those who have lost everything and are trying to rebuild their shattered lives in a strange land. Eight million children are estimated to be in urgent need of assistance inside Syria and neighbouring countries due to conflict. 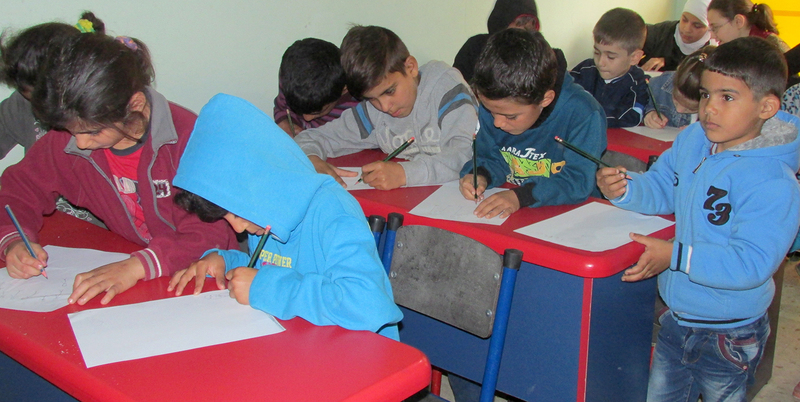 Viva is working alongside local Lebanese NGO, LSESD, and its networks of church partners in Syria and Lebanon, to develop child-focused programmes. Please pray for the development of child friendly spaces – safe places for children to come every day where they can play, learn and receive support – and for the growing number of informal education projects. In today’s world of often unpredictable and long-lasting conflicts, churches are willing to be involved in caring for children and their families for the long-term. This is critically needed right now. Pray that leaders will be encouraged in tough circumstances and that refugee children would rediscover a joy, peace and hope. Many mothers, like Zeinah, initially come to the refugee centre activities to occupy their children. However, they discover that Christians trained in counselling and trauma care are also there and greatly benefit from their compassionate ministry. Being able to pour out their pain in a safe and nurturing environment and hear about the love of God is a powerful source of healing and hope for many. Support from the Church has enabled many mothers like Zeinah to know that God hasn’t forgotten them. Praise God for the generosity of the Lord’s people, and pray for all those receiving care to know the compassionate heart of God. With the increase of civil and religious war, Syrians are fleeing their country and crossing borders into Turkey, Jordan, and Lebanon. Workers report that multitudes of refugees are disenchanted with Islam due to the abuses they have experienced at the hands of other Muslims. They describe the eagerness among Syrians to embrace the secure hope that we have in Christ. A team recently reported, “God is moving in an unparalleled way among the Syrian people. As we went from home to home, visiting families we shared the good news of Jesus, explaining how his sacrifice covers all sin, and in every single home we visited, God opened eyes and hearts…every single home yielded fruit. The harvest in this part of the world is ripe and we must pick now. It cannot wait!” Pray for Syrian refugees, that many would have the chance to hear the gospel as workers minister to them with compassion and love. Ask God to send more labourers who will courageously follow Jesus to love refugees and displaced peoples. More than three years on, the civil war in Syria shows no signs of ending. Sadly, nor does the suffering of more than 9 million ordinary Syrians who are in need, including 3 million refugees. Many are homeless, have no income and no certainty of what lies ahead. As people continue to seek a safe place to escape from the fighting, Tearfund’s partners are providing food, help with shelter, clothing, stoves and hygiene goods. Eventually, we hope to help refugees return to their homes. For those living in the midst of Syria’s civil war, death could easily become a preoccupation. Three years into the conflict, it’s estimated that 5,000 people are being killed each month with the overall death toll at 150,000. For civilians caught in the middle, the struggle for survival is as unrelenting as the sound of gunfire and explosions. Providing aid is also a challenge. Pray for the efforts of Christian organisations to go where the need is greatest and to help a population that’s increasingly under strain. The 15th March 2014 marked the third anniversary of the on-going conflict in Syria. It’s hard to comprehend the degree of suffering and devastation that these three years have seen. More than 100,000 people have been killed, and every hour now, more than 300 people flee their homes in fear. As the conflict drags on, the people of Syria need our persistent and determined prayers more than ever. We know that, even in the darkest places, God can shine the light of his love and hope. The United Nations announced in August that one million children had been forced to flee Syria and live as refugees in neighbouring countries – the worst such crisis since Rwanda almost 20 years ago. Unicef states that a further two million children are displaced within Syria itself. The situation has deteriorated further since then. Please pray for children living in cramped conditions as refugees, with limited food and water, without the opportunity of school and traumatised by their experiences – may God bring them comfort. Pray for children who have seen friends and family killed or injured, and who live each day in fear - may God bring them peace. Finally, pray for children growing up in a place of hatred, violence and death, denied a childhood of love and enjoyment, and not able to trust adults - may God bring them hope. As the situation in Syria deteriorates further, we continue to cry out to God for those caught in the conflict. 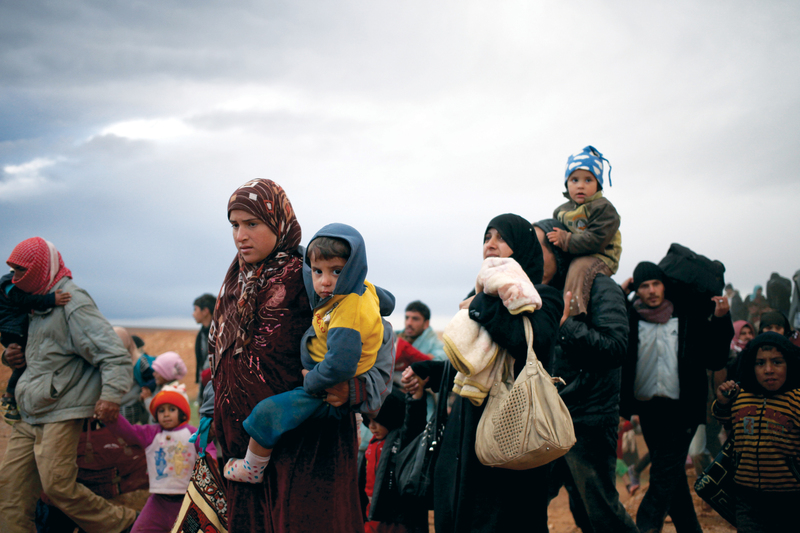 To date, 1.5 million people have fled Syria, and well over 4 million people have been displaced within the country. Chilling reports of a massacre in the western districts of al-Bayda and Baniyas in May highlighted the horrors the Syrian people are facing. With food, water, shelter and medicines running low, the UN estimated that over a third of the population is now in need of humanitarian assistance. Join us in praying for hope and peace for the people of Syria. In March, the UN announced that the number of people to have fled the worsening conflict in Syria had reached one million. Through a church in the coastal city of Latakia, our partners are now providing help and comfort to over 100 families of refugees who have fled the destruction of their homes and the loss of loved ones. Some are Christian, but the majority are Muslim and are coming into direct contact with a Christian charity for the very first time. This is a key moment to show them the compassion of Christ. Pray for this ministry and for an end to this terrible conflict and the suffering it’s causing. Syrian Christians are in much need of our prayers. One of the slogans being shouted out in the streets is, “To Beirut with the Christians and to the grave with the regime.” The violence is centralised in specific cities, but the fear and unrest is widespread. According to a pastor in a city 100km south of Damascus, Christians feel very weak and need a great deal of encouragement. He asks us to pray for Christian leaders NOT to leave Syria. “Pray also that God will give all Christians wisdom in what to do or not do in these challenging times. Pray for clear vision for the Church to lead the people.” The Church is very afraid – please pray against the spirit of fear. Christians in the Syrian city of Homs report ‘ongoing ethnic cleansing of Christians’ by al-Qaeda Islamist militant groups in Syria. Some reports indicate that nearly 90 percent of Christians living in Homs have been expelled and forced to flee their homes - estimated to be over 50,000 people. Pray for Christians in Syria as tensions continue to mount. Pray for protection, peace, and the very presence of God for our brothers and sisters there. Pray for an unleashing of the Holy Spirit and for those who carry out the persecution to encounter our Living God.